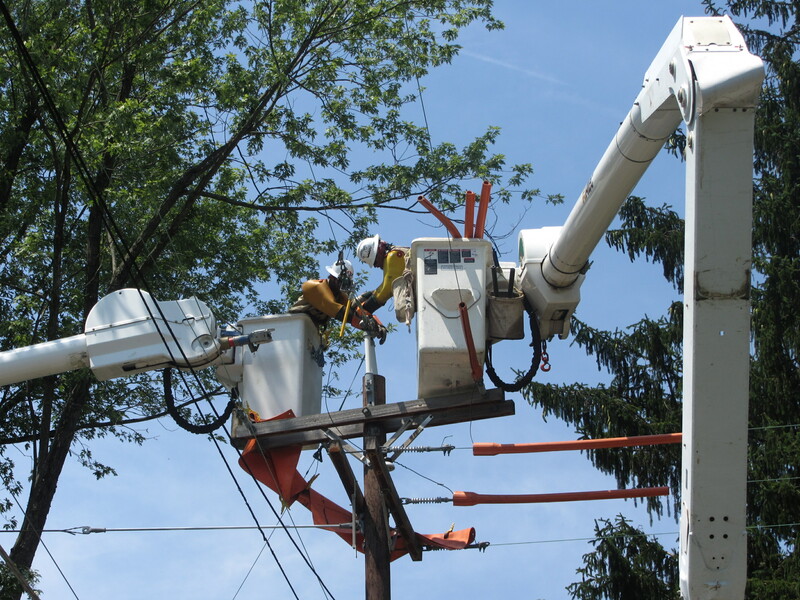 A crew from Alabama repairing downed power lines in Maryland near my office. Electrical power was out in my part of the world for a couple days earlier this week due to the fierce thunderstorm that struck the Midwest and Mid-Atlantic on Friday. Some parts are still without power and although I haven’t conducted a survey to see how the nearby historic sites fared, I have heard that one historic house museum in Virginia is facing about $30,000 of clean-up costs due to fallen trees and branches. Please accept these comments for the public record regarding the draft guidelines for the FY 2013 Museums for America and National Leadership Grants for Museums programs of the Institute of Museum and Library Services. I appreciate the federal government’s long support for museums across the United States and I have been part of organizations that have directly benefitted from IMLS grants. I have personally witnessed IMLS funds used to help a local history museum recover from a fire, improve the visitor experience at four National Trust Historic Sites, and develop a graduated set of best practices and standards for history organizations. Furthermore, I appreciate the IMLS’ national role in improving and enhancing community life through museums by providing not only grants, but staff training and resources, such as the WebWise Conference. 1. Rather than offer only one annual deadline on January 15, offer two grant application deadlines: February 15 and August 15. This provides museums more opportunities to apply, so if they miss the deadline, they don’t have to wait another year to apply (plus an additional six months to find out if they are funded). Although the revised guidelines allow museums to submit more than one application, it is highly unlikely that smaller museums have the staff to do this, giving an unintentional advantage to larger institutions. Placing a deadline in January conflicts with many of the year-end events that occur at museums. In December when many museums host holiday events for the public and receive significant donations as year-end gifts, adding the preparation of a major IMLS application will reduce both the number and quality of applications, especially from small museums who don’t have the staff to do all of this work at the same time (and again providing an unintentional advantage to larger institutions). 2. IMLS’ goal to reduce the application processing time by 50% by 2016 is admirable and strongly supported. The turn-around schedule on most of your grants is so slow and chances of getting funded so low, that it’s a major deterrent to many organizations. There are increasingly less painful and more convenient sources of funding, which is making the projects you fund less relevant and innovative in the context of the whole field. 3. Create a separate program offering small grants with a faster turnaround and higher funding ratio. The revised guidelines allow budgets that range from $5,000 to $150,000, which places projects far too disparate in the same category for reasonable review and consideration. Funding decisions are based on criteria that assume that projects are roughly similar, but with this budget range, it could include small projects such as a local history book to large projects as a national traveling exhibit. Applicants recognize this disparity and given the time and effort required to prepare an application, will submit for the largest grant possible or assume only large ambitious projects will be competitive (again, giving the advantage to larger institutions). I recommend you separate the programs along grant size (e.g., $5,000-$25,000 and $25,000-$150,000) and simplify the application process for the smaller grants. The National Endowment for the Humanities provides a successful model for this type of federal grant program in its Preservation Assistance Grants which can be adapted for the IMLS focus areas of improving museums’ abilities to offer learning experiences, become community anchors, or be better stewards of their collections. Most museums in the United States are small–that is, have a budget of less than $250,000 and fewer than two fulltime staff. The revised guidelines inadvertently provide a significant advantage to larger institutions. I assume this is not the intent of the proposed guidelines given IMLS’s mission and strategic plan, however, this can be overcome by adopting the recommendations suggested above. Please don’t assume that my comments alone will affect any changes–they need to hear from the field, especially small museums and historic sites (you’re welcome to use my letter as a model). Otherwise, the new guidelines will be adopted with one annual application deadline of January 15. We’ll find out in October 2012, when the final guidelines are released. This entry was posted in Collections, Fundraising, Historical interpretation and tagged Institute of Museum and Library Services on July 6, 2012 by Max van Balgooy. Excellent, practical and equitable recommendations! Thanks for doing this, Max, and hope that IMLS pays close attention so that it can continue to further good causes, large and small.